Chinese New Year has always made me happy; delicious home cooked food, get-togethers with family and friends, and of course, the angpau! Being back after 2 weeks vacation, I am still not in the right mood for anything. Seriously, I need to get out of my vacation mood and get back my blogging mojo. This is the Queen, the most important person in my life. Flowers in my mom's garden and I have no idea what it is called. *dong dong dong chiang* It was exciting to see the enthusiastic lion dance! 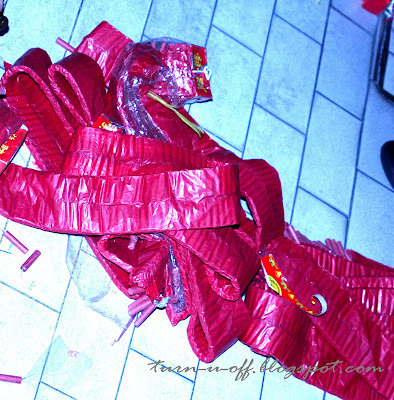 Without noise makers firecrackers the CNY would be incomplete. 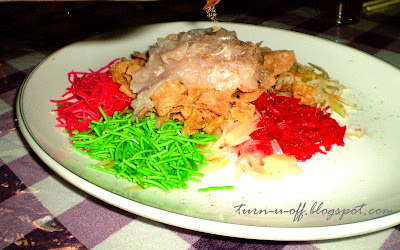 Yee sang, an auspicious must-try dish during CNY. 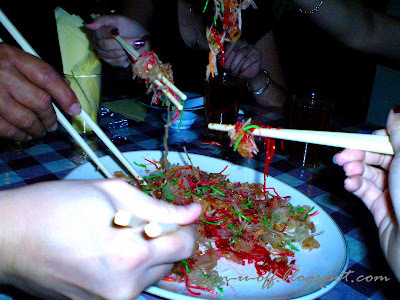 It is said that while tossing the yee sang, you have to wish out loud for what you want, and raise your chopsticks as high as you can. Dang I was too hungry and I forgot to say my wish aloud! 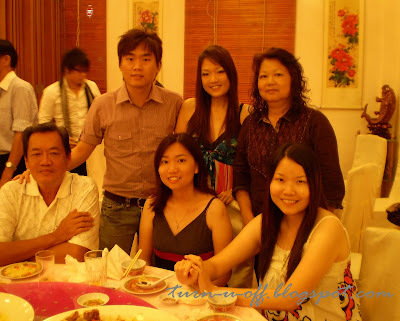 Cousin brother, Dr. Nick got married on the fifth day of CNY. 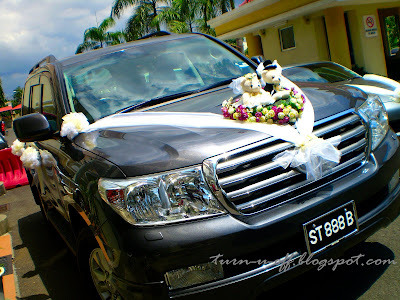 That's the wedding car. As usual, I took a ton of pictures! I'll post some soon, I promise! And, I will drop by all of your blogs to catch up as soon as I can. So... how was your CNY / Valentine's Day? May we all have a Tiggerific year ahead! oh yeah! i love the first image te mon! 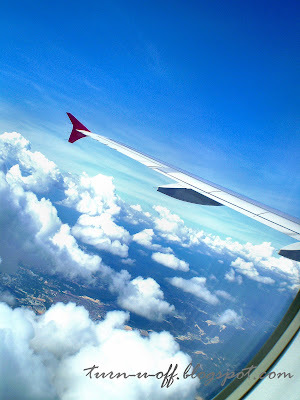 u really took photo inside the plane la! >:o >:o >:o GG FC1! Thanks for sharing your lovely pics, mon!! Makes me feel so festive and prosperous gitu!! LOL! Anyways, I hope you have a great tiggerific and terrific new year.. may you have great health and wealth, happiness and joy and all the things that you've dreamed of AND more!! eh no RT button here mon?? or it didn't load? I love the first pic, and have done that before being on a plane! I like the family and food pics you posted here, too! Euphorbia plant? wah so pandai la u!! ;) :) thanks for letting me know GG! Nessa!! thanks :-D haha looks weird eh? 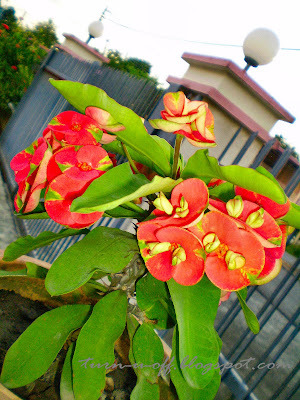 according to GG, that is a Euphorbia plant! 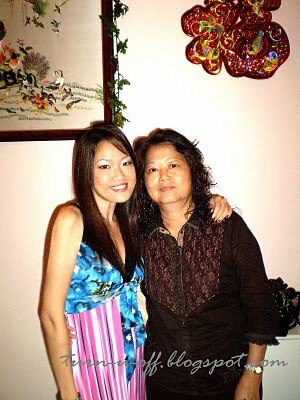 I love the picture of you and your mom dearie. 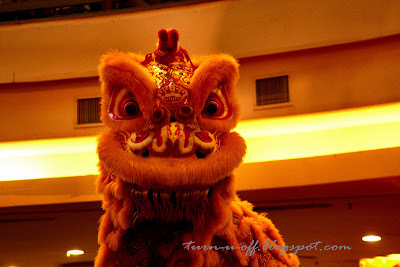 .so nice..i love the lion dance though the firecracker.. hmm.. not too much :( always gives me shock one.. lol! haha :D I love the lion dance. :D It look rather cute. yalor u missed the chop! LOL yalor car plate number so :-$ :-$ :-$! 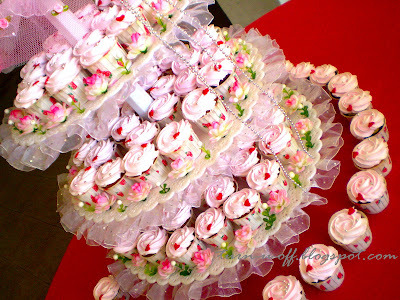 haha yeah those cupcakes are gorgeous n yummy! 3-hour flight? so what did you do Mon? So happy for you! what a great family new year! Thanks Rizal! huh??? she looks like the late "Datin Sri Hendon"? hahahahhahaahah!!! Hi Ayie! :* :* :* thanks!